Sri Rama was the embodiment of Dharma; He was a great personality endowed with great valour coupled with all virtues. He was the King of all Worlds yet chose to go to the forest forsaking all pleasures obediently following the words of His father to Kaikeyi. The great epic ‘Sri Ramayana’ is not just a story which happened long ago; it has a philosophical, spiritual significance and a deep truth in it. The words ‘rays’ and ‘radiance’ come from the Sanskrit root word ‘ra’. ‘Ra’ means light, ‘Ma’ means within me, in my heart. 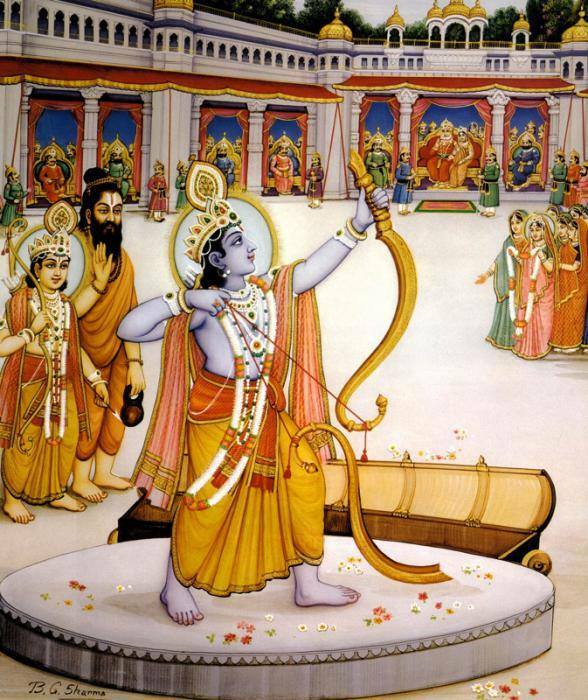 The mighty warrior yet the most benevolent Rama was born in Ayodhya. Ayodhya means ‘a place where no war can happen’. When there is no conflict in our mind, then the radiance can dawn. Valmiki Ramayana, Adhyatma Ramayana, Vasishta Ramayana, Ananda Ramayana, Agasthya Ramayana in Sanskrit, Ranganatha Ramayana in Telugu, Kamba Ramayana in Tamil, Tulasi Ramayana or Ramacharitamanasa in Hindi, Kirtivasa Ramayana in Bengali, and Ezuthachan’s Adhyatma Ramayana in Malayalam are some of the well known versions ~ there are more too. For all these works on the saga of Rama, Ramayana authored by Valmiki who is called Aadi Kavi has been the basis. When Rama was a young boy, he was the perfect son. Later he was an ideal husband to his faithful wife, Sita, and a responsible ruler of Aydohya. 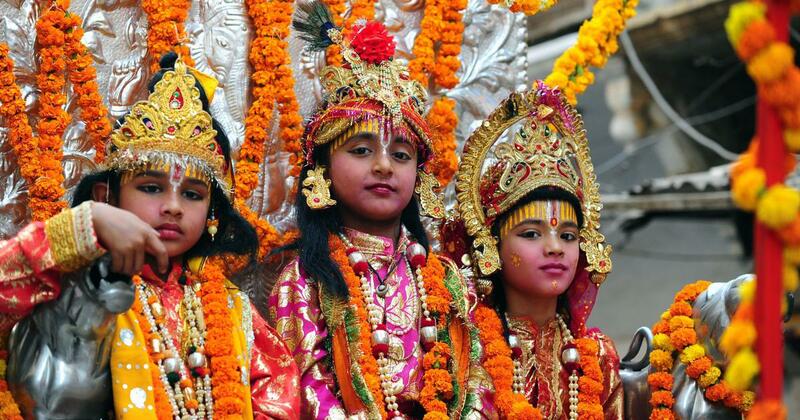 "Be as Rama," young Indians have been taught for 2,000 years”. When King Dasaraqtha banished Rama to forest and ordered Bharata be crowned, the faultless Sri Rama accepted the decree unquestioningly. "I gladly obey father's command," he said to his stepmother. "Why, I would go even if you ordered it." The tourism wing of Indian Railways will run a unique pilgrim train, Shri Ramayana Express, from November 14. The train will be flagged off from Delhi Safdarjung railway station. "The train will cover all important destinations associated with the life of Lord Shri Ram in a 16 days all inclusive tour package which is spread both in the countries of India as well as Sri Lanka in which 4 destinations will be covered," said the railways in a statement. IRCTC communiqué says that after leaving Delhi, the train will make its first stop in Ayodhya followed by Hanuman Garhi Ramkot and Kanak Bhawan temple. The train will then cover the important destinations of Ramayana circuit such as Nandigram, Sitamarhi, Janakpur, Varanasi, Prayag, Shringverpur, Chitrakoot, Nasik, Hampi and Rameshwaram,"
For pressitudes and secularists, any reference to ‘Lord Sri Rama or Sri Krishna’ would immediately open the sluice gates for discussions and ‘award-vapsi’ – in a secular State, the party (BJP) is trying to divide people with religion – there should be no talk about religion, immediately a non-starter of dozen unheralded parties would go on appealing !! ~ said is the State of affairs – to them anything connected with Hinduism is bad – and one can hear cacophony of some actors crying hoarse !! ~ at this juncture a party (now reduced a party in a State) is planning to spread awareness of Sri Rama .. .. !! !! - and it is not BJP, any of its affiliates or any Right wing party ! Kerala’s ruling communist party is rethinking religion, admitting that the ‘opium of the masses’ may have its uses. The Communists in Kerala swear by their working class ideology and dialectics, but in practice they deftly spin it to survive and gain from a neoliberal world order. On paper, they are Communists, but in reality, they can only aspire to be, at best, social democrats. Marxists would certainly detest being called social democrats because ideology is what they wax eloquent about and what gives them cover. Everything they do, whether it’s an alleged political murder or taking advertisements from homegrown crony-capitalists, are ideologically sanitised by their formal and informal network of supporters and proxies. Everything, according to them, is part of their long-term plan of a revolutionary project. Kerala’s Sanskrit Sangham, an organisation formed last year under the aegis of the Communist Party of India (Marxist), has embarked on a mission to spread awareness about the various versions of the Ramayana. Its members say this is being done in order to prevent the Sangh Parivar from appropriating the ancient Indian epic for political gains. One immediately remembers that its rank and file were encouraged active engagement with religious beliefs and customs, having held massive public rallies on Janmashtami, the Hindu festival. For the last few years, the party has been holding rallies with tableaux of Hindu gods—borrowing a leaf from saffron organizations, but mixing it with European communist icons Karl Marx and Joseph Stalin. Now the month-long initiative will begin on July 15 with a series of seminars titled Thoughts on Ramayana that will be held across all of the state’s 14 district headquarters. It is trying to camouflage claiming that Sanskrit Sangham is collective of people who love the Sanskrit language. “The majority of them are CPI(M) sympathisers. As usual they maintain that the outfit was not a feeder organisation for the communist party. The organisation was possibly inspired to launch this exercise after seeing the huge success of a lecture series on the cultural history of the Mahabharata, the other major Indian epic, by Left-leaning intellectual Sunil P Ilayidom. Ilayidom’s lectures on the epic in several Kerala cities in 2016 drew thousands of people as audience members. It also attracted a huge online viewership. His speeches dwelled on the diversity and pluralistic essence of the Mahabharata. But political observers say that there could be more pragmatic reasons behind the seminars on the Ramayana. They are trying to ape RSS and trying to get some political mileage by propagating Ramayana & Mahabaratha in their own flavour. Since 2016, the party has also been promoting yoga under the banner of the Indian Martial Arts Academy and Yoga Study Centre. If the Ramayana seminars draw a good response, the Sangham plans to organise similar events on the Mahabharata, Vedas and Upanishads. The seminars begin two days before the start of the month of Karkidakam, the last month of the Malayalam calendar. In Kerala, it is also known as Ramayana Masam or the month for reading the Ramayana. Some Hindus in the state read the Adhyatma Ramayanam during this 30-day period. Kodiyeri Balakrishnan, the state secretary of the Communist Party of India (Marxist) denied that the party was celebrating Ramayana month. “CPI(M) is not organising any such event,” he said – but would the Commies come out in open and keep away totally from any link to the newly floated outfit and its diluted ideology ? Secularism has many many definitions ~ and Kerala communists are trying to give their own colour !